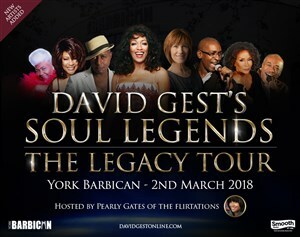 David Gest Limited has some good news and some bad news about the up and coming ‘DAVID GEST’S SOUL LEGENDS’ Tour. The bad news is, due to circumstance beyond our control, the ‘DAVID GEST’S SOUL LEGENDS’ Tour has been delayed. The good news is that the tour will be back on track from 15th October 2018. Existing tickets will still be valid for the new date in your city. If you cannot attend the new date then please contact your point of purchase for a refund. David Gest Limited remains incredibly grateful for all the loyalty, patience and support fans of the late David Gest and the amazing artists have shown us. The Tour will continue to support charities close to David’s heart. Please see below for new UK tour dates and we thank you again for your understanding.